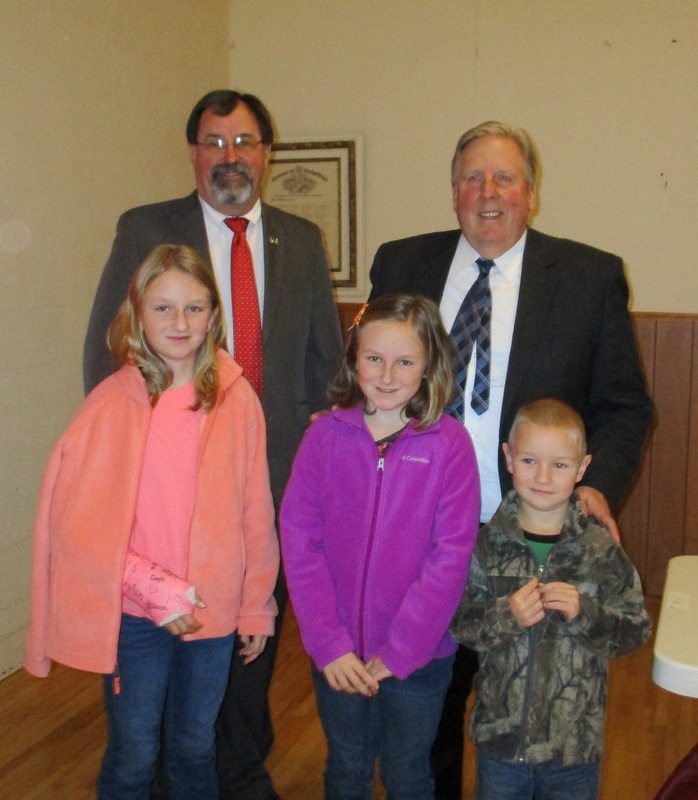 Homeschooled students (from left) Abby, Lydia, and Silas Greenough got a lesson in civics on Oct. 25 when they attended a Bradford County Commissioners meeting held in their community. Commissioners Daryl Miller (back, left) and Doug McLinko conducted the meeting at the Smithfield VFW to bring attention to its ongoing restoration. The regular public meeting of the Bradford County Commissioners on Oct. 25 was held at the old VFW hall in Smithfield Township. Afterward, the media was invited by the township supervisors to tour the iconic building that has been the hub of community celebrations since 1946 and to learn of their future plans. 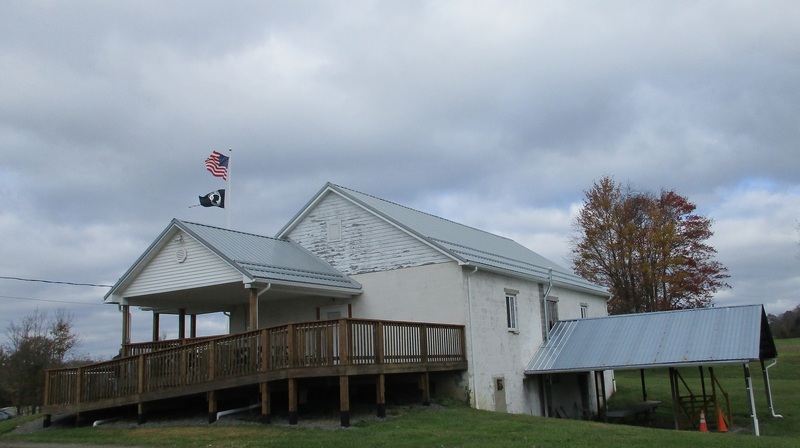 The aging membership of the VFW, known for their summer picnics and spectacular fireworks displays, shrank to a point of no longer being able to support the property. They gave it to the township about 10 years ago with the stipulation that no taxpayer funds could be used for its upkeep. Most importantly, the supervisors want to add an ADA-compliant restroom. There are two restrooms in the basement that are part of the original construction, but they are small and not handicap accessible. There is also a kitchen on that floor and the remains of an old barroom. “A lot of things have not been updated since the ’40s,” said supervisor Jackie Kingsley. 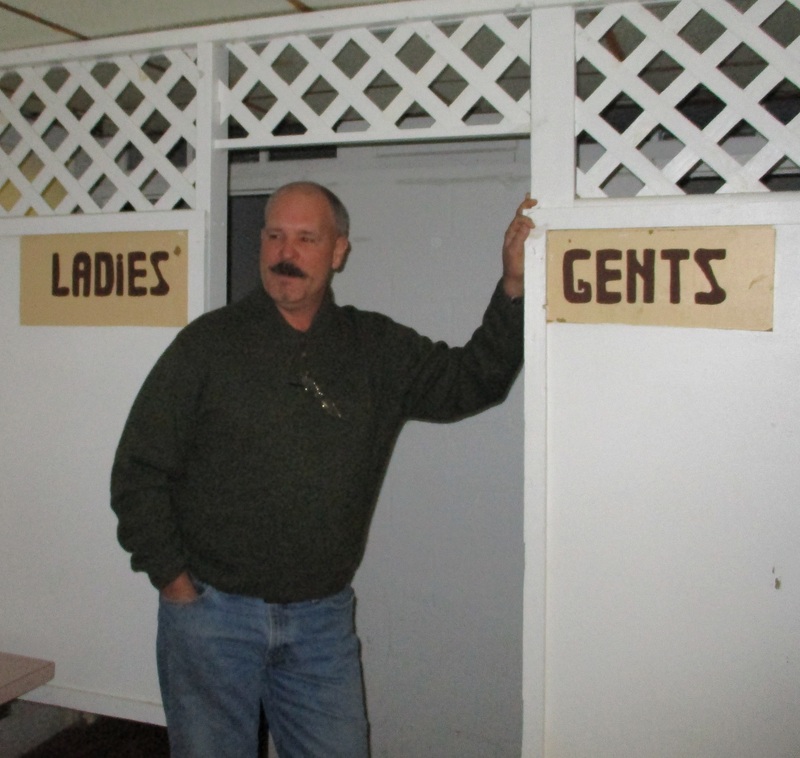 Supervisor Russ Burkett (above) explained that there are no intentions to restore the former club room. The relentless rains of this past summer revealed the potential for flooding and mold. A new deck and roof paid for with gas royalties cured the leaks, but the supervisors are reluctant to deal with any unknown health issues that might be caused by dampness. The main floor of the building is the primary focus of their efforts. A ramp to the new deck made it ADA-compliant, and local resident Leonard Souto provided the labor necessary to restore the hardwood floors in the main hall. Now, the supervisors are planning to construct an addition to the building for the new restroom. The county commissioners approved a $32,000 community block development grant last year for the project but, according to supervisor Brian Harris, the funds had to be applied to the existing footprint of the building. The supervisors doesn’t want to sacrifice any additional space, as they want to start renting the hall for weddings and other functions. The supervisors credited the county commissioners for their continued support of their endeavors and are hopeful that the conditions for use of the CBDG money can be modified. In the meantime, however, they are seeking alternate funding sources. The annual Summer Fest was all but rained out this year, but the supervisors are hopeful that local residents and businesses will step up to help them bring the project to fruition. Smithfield Township resident Nancy Mitchell took advantage of the commissioners’ visit to her neighborhood by bringing to their attention a tragic event that happened 66 years ago and the hopes of a group of citizens to permanently commemorate it. According to Mitchell, a navy pilot named Eugene Bernard of Kansas City was flying in tandem with another pilot when Bernard’s plane lost power and crashed in a field not far from the Smithfield Township VFW building. “It was a horrific scene,” Mitchell recalled, noting that she was five years old at the time. A temporary fence had been erected around the crash site, and Mitchell was barely tall enough to look over it. An effort is underway to erect a monument at the site to honor the pilot, who flew 98 combat missions during the Korean War. Half of the estimated $1,600 needed for the project has been raised, and Mitchell was hoping that the commissioners might be able to steer some Act 13 funds toward the effort. She was delighted to learn from Smithfield Township supervisor Jackie Kingsley that the township had approved the release of matching funds at an Oct. 23 meeting.